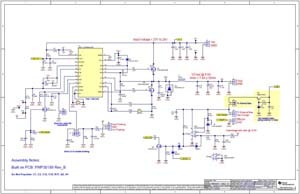 The PMP30301 reference design is based on the LM5117 sync buck converter; it supplies 12V @ 6.5A and it is protected against overcurrent at 7.4A. The internal bias can be supplied internally by means of internal linear regulator, or externally by BJT and Zener diode, thus reducing power dissipation in LM5117-Q1. Also the switching frequency is selectable between 100 KHz and 250 KHz. An external tracking input can be used to perform sequencing and soft start tracking. It features also output overvoltage protection with latch.